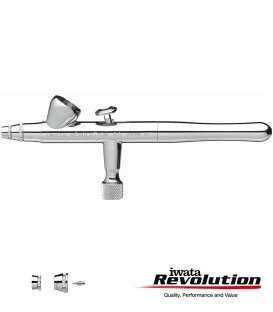 IWATA REVOLUTION HP-TR1 03 airbrush Iwata Revolution airbrushes iwata airbrushes airbrushes AIRBRUSHING - Belles Arts Ferran, S.L. 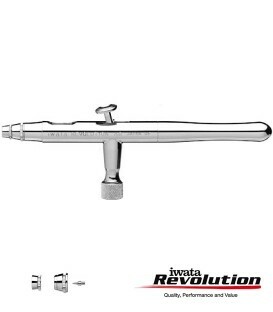 Featuring a uniquely designed Pistol Trigger with a fixed dual-action operation, the Iwata Revolution TR Airbrushes deliver comfortable, ultra-smooth performance that's ideal for custom automotive painting. 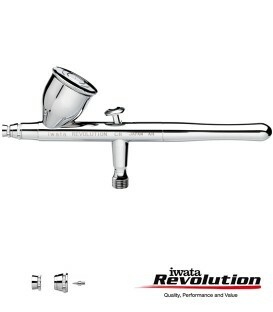 Equipped with the new FA450 Iwata Pistol Grip Filter that acts as a superior defence against moisture, the HP-TR1 give total control over paint and spray just like conventional airbrushes. 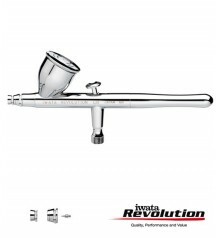 Their designs offer the same comfort and feel that's typical of a larger spray gun. Each is impervious to solvent-based paints thanks to the Teflon packing needle seal, which can be easily replaced. The HP-TR1 (0.3mm) comes with a 1/4 oz. side-mount colour cup.